Scientists are inching closer to a cure for spinal cord injuries, thanks to a research team that used Berkeley Lab's Advanced Light Source (ALS) to determine the structure of a protein that prevents neurons from repairing themselves. The protein is dubbed the Nogo receptor because it binds with several other proteins that block neural growth. It's found on the surface of thin fibers, called axons, which carry information between neurons in the brain and spinal cord. Researchers believe that if they can pharmaceutically block the interaction between the Nogo receptor and these growth-inhibiting proteins, then severed neurons may fuse back together, and paralyzed people could walk again. A detailed understanding of the Nogo receptor may lead to a treatment for spinal injuries. "This is an important step," says Gerry McDermott, a staff scientist in Berkeley Lab's Physical Biosciences Division. "It's the first time the Nogo receptor has been structurally determined at this resolution, and it sets the stage for further research that may lead to drug development." Unlike most cells, neurons in the spine and brain lose their ability to regenerate shortly after people reach adulthood. Their incapacity to grow seems to appear when axons develop a fatty, insulating layer called myelin. In addition to improving the flow of nerve impulses between neurons, some scientists theorize that myelin locks an adult's fully formed neural network in place, preventing the development of new and potentially harmful circuits. Ordinarily, this is fine. Healthy adults possess all the neurons they'll ever need by the time they've matured. But it also means that neurons can't repair themselves if they're damaged by trauma, stroke or diseases such as multiple sclerosis. To learn how to rewire broken neurons, researchers have spent the last several years hunting for proteins that block their growth. In 2000, a team of scientists determined that the Nogo protein, which attaches to myelin, plays a key role in inhibiting axon regeneration. One year later, the same team found its mate -- a receptor located on axons that binds with the Nogo protein and enables the protein to do its job. Since then, much more has been learned about the Nogo receptor. Not only does it bind with the Nogo protein but with at least two other growth-inhibiting proteins. "All three of these proteins can block neuron growth, and they are all structurally different," McDermott says. "This means we have to understand the binding mechanism of each protein before we can develop ways to hinder their interaction." As part of this investigation, Stanford University School of Medicine's Christopher Garcia and his team crystallized the receptor and turned to Berkeley Lab's ALS, where they exposed it to extremely bright x-rays that reveal the receptor's molecular structure. At a resolution of 1.5 angstroms, the receptor's strange shape comes into focus -- a curving molecule with a spine and a belly. In addition, the concave portion of the molecule appears to harbor a rich binding site capable of grabbing a wide range of proteins. And although the image doesn't reveal precisely how the receptor binds with so many proteins, it lays the groundwork for further research that could. 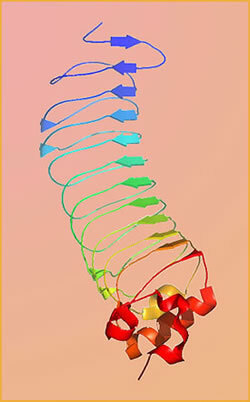 "We have the initial structure, and now we have to see how the growth-inhibiting proteins bind to it," McDermott says. "This work will help determine the pharmaceutical path to restoring neuron growth." To do this, the team will next crystallize the receptor in the presence of the three proteins, and again use the ALS to visualize precisely how the receptor interlocks with each one. With this information, researchers can then develop synthetic peptides that bind to the receptor in exactly the same configuration as each growth-inhibiting protein, creating a cap that renders the receptor inert. Such drug therapy isn't far-fetched. Last year, a Yale University team developed a peptide that blocks the interaction between the Nogo receptor and the Nogo protein, a feat that sparked the growth of nerve fibers in rats. Similar success in people is perhaps years away, but a growing wave of research, such as the close-up view of the Nogo receptor, is helping scientists zero in on a treatment for the approximately 11,000 Americans who suffer spinal cord injuries each year. The x-ray crystallography work was conducted at ALS beamline 8.2.1, which is funded by the Howard Hughes Medical Institute. In addition to McDermott and Garcia, Xiaolin Li and Fernando Bazan of Stanford University School of Medicine, Kevin Wang of Harvard Medical School, and Marc Tressier-Lavigne of Stanford University contributed to the research. The study was published in the April 24, 2003 issue of Neuron.